The next phase riding through Guizhou, heading south from Guiyang, started off easily, but after couple of days we were back in the mountains and due to floods and landslides we were into some impressive off-roading. The Guizhou hotel buffet breakfast was one of the best so far so we ate as much as we could stuff in before leaving. We headed south out of the city down to the railway station. The wide grand four lane highway ends at the the station and turns abruptly onto a narrow, rough cement road through the less cosmopolitan part of the city, a great contrast from the slick Hong Tong Mall and the high rise hotels. 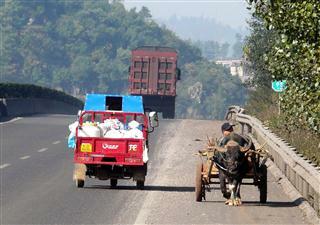 We came onto a six lane highway out of town and were surprised by the number of Guizhou police on duty along the road. On average there was one every 250m for the next 17km. They all looked too young to be police and were smartly turned out with sparkling white gloves on. It was like having a guard of honour. Just slightly less numerous were the street cleaners who were diligently sweeping the road and pavements. We decided that some important person must be expected but never got to know who it was. 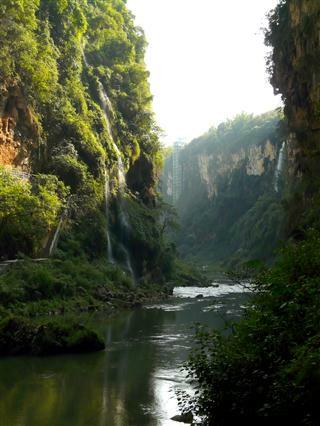 By midday we reached Qinyan, Guizhou. 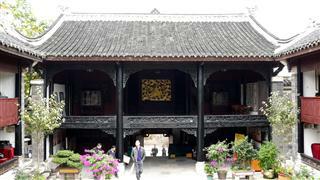 This Guizhou town was originally built in 1378, in the Ming dynasty to house troops. 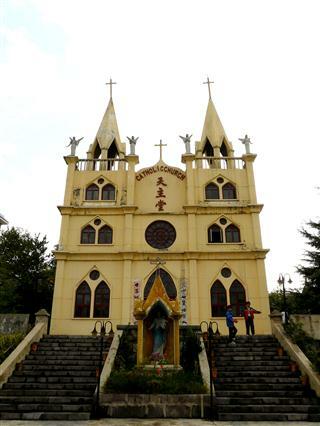 Its stone building, temples and narrow cobbled and stepped streets remain virtually intact and it is now understandably a Guizhou tourist department hot spot. As always there was an admission charge but the girls at the desk let us leave our bikes in their back room while we wandered round. 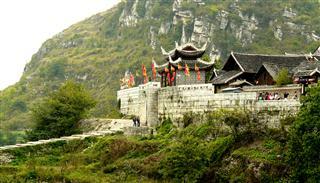 It is a fascinating place, enclosed with an impressive wall with four arched gates. 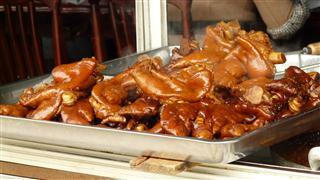 It is famous for some strange culinary delights: Pigs trotters, a special tofu, chicken peppers and many types of smoked animal parts. In one of the Guizhou temples were some incredible fossils of flowers and leaves. In another there was an example of an old loom for weaving silk and rows of bonsai trees. Not long after leaving Qinyan, Guizhou we had our third puncture in four days, this time Steve's back wheel. The edges of the roads here are littered with broken glass, bits of plastic and metal. A man went past us on a motorbike with a large, apparently live, snake coiled around his handlebars. After booking into the only hotel we could find in Huishui, Guizhou we had just enough time to get showered before the Guizhou police were knocking on the door again. It seems that the hotel staff really struggle to fill in the registration forms as they can't read the English on the passports and visas. 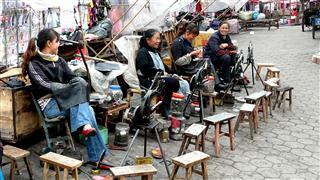 On the corner of the street sat a whole row of women waiting for sewing work. With only a short day's Guizhou ride, we had a lie in, brought fruit and buns for breakfast then sat at the side of the road to eat them. The first valley we rode through was very industrial with large processing plants, concrete block manufacturing and yet more quarries. It was smelly and dusty and the road was very busy. They are building another motorway and this seems to be attracting yet more industry with several big building projects underway. The next valley was more rural but still we could see the massive motorway construction in the distance. It seems like the road is being constructed to run midway between the mountain peaks and the valley floor so there are long elevated sections standing on massive concrete towers. Parts of the mountains have been blasted off to build cuttings and then every so often the road disappears into long tunnels. An impressive feat of engineering. The weather was overcast again and our mood wasn't too good. It's gets a bit tiresome at times being the constant centre of attention and Steve almost lost his cool with a trio of teenagers as they cruised slowly past us on their motorbike for the fourth time. A little later a man in a four wheel drive was so busy looking at us as he passed that he misjudged the bend and nearly skidded off the road into the ditch. Rolling into Changshun, Guizhou we saw a big, expensive looking hotel and Steve went to enquire about the price. He thought the receptionist said 300 Y, which was too expensive , and walked out. Karen meanwhile was 'chatting' with a group of local ladies. By sign language they asked how old she was and appeared very impressed with the reply. We couldn't find any other hotels and on return to the first one found it was actually only 150 Y, but we needed to leave a deposit of 300Y. As usual we had eaten and into bed by 9.30pm. At 11.30 there was loud knocking on the door. The Guizhou police needed to see our passports. At 7am in the morning the clock tower on the little hill, just behind our hotel, woke us with the strains of 'Jingle Bells'. It was pouring with rain and the clouds were grey and low. Steve didn't want to ride but Karen couldn't bear the thought of a whole day in a town with nothing to see or do and no Internet, so she insisted he get up and on his bike. Breakfast was included in the hotel price and we sat there with our noodles in watery soup, steamed buns, hard boiled egg and rice porridge. As we ate we could hear the chef in the kitchen coughing and spitting and were totally put off the mucous like, glutinous, tasteless rice porridge. The rain was just drizzle as we rode out of town. The road was reduced to a single lane as they were re-laying the concrete. It started to pour with rain and we couldn't stop because there was so much traffic on the narrow road. Karen thought she could cycle over the new section of concrete to the other side of the road but it was still wet and a little man who was sheltering from the rain came out and shouted at her.Now soaked, we managed to stop at an office to shelter until the worst passed and we could get our ponchos on. 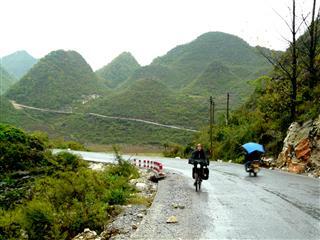 It continued to rain heavily for the next two hours and the road climbed up slowly through the Guizhou countryside of big pointy mountains. The hills were wooded and the views fabulous as the clouds started to clear and the sun came out. Everyone was very friendly and greeting us as we passed. According to the Google map of Guizhou, the road ended after 35km and we presumed that the remainder of the ride would be on an unsurfaced track. It was a nice surprise to find that it is now all tarmacked. We sat at the side of the road for a snack and a man came up to chat. He had a speech impediment and so had developed good skills in mime so we could actually understand some of what he was saying. Passing a small scruffy village we spotted a building that was obviously a Christian church and turned off to get a closer look. It was a small, simple Catholic Church, one of the first we have seen here. A group of teenagers were playing in the yard and insisted we go up and have a look at the inside. At the top of the next climb we had puncture number four, again glass. Dropping down to the next valley we were back in the middle of the motorway building. We had to ride through the construction traffic along a very muddy, rough track for about 500m and we got covered in gunge. At the top of the last pass before Ziyun, Guizhou there was a row of about a dozen people sat at the side of the road, each with a basket full of different types of mushrooms picked from the forest, hoping to sell them to passing drivers. 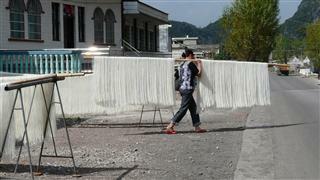 There was a car wash on the way into Ziyun,Guizhou just a lady with a power-washer. She washed the bikes, the bags and even scrubbed our shoes for us so we could get into a hotel without causing consternation. Searching for food that evening we walked all round the town but found nothing to entice us except a few kebab stalls on the market place. Then we stumbled across a whole street of restaurants, all of the 'private dining room' type. The most promising one had a big tank of river fish outside. 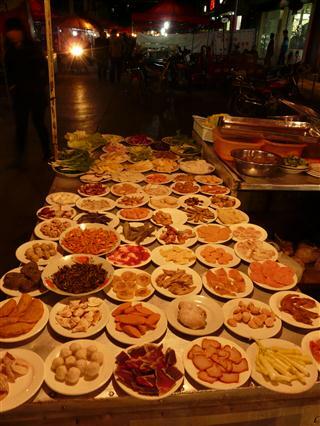 The classic Guizhou meal consisted of a large pan of broth set on a gas ring in the middle of the table. The fish was very thinly sliced and served with raw cabbage, bean sprouts and slices of turnip. The vegetables go into the broth to cook and the fish is dipped in for a minute to cook before dipping it in a soy/chili/coriander marinade. Very good but very expensive at 200 Y. The three young waitresses couldn't take enough photographs of us with their mobile phone cameras. 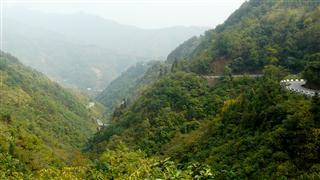 We had profiled today's Guizhou ride on 'Map My Ride' so knew what to expect, or thought we did. 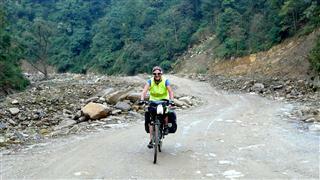 110Kms with few villages and a total climb of 2,000m reaching a maximum altitude of 1,450m. 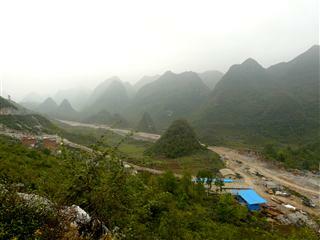 There were some big ascents but the last 30km was downhill, following a river valley into Wango, Guizhou. If we completed the 80kms by 4.00pm we could do the descent in about an hour. Little did we know that this ride had a sting in its tail. The plan was to set off early but we didn't leave town till 8.50am. The first 35km were relatively easy, flat and downhill on a newly resurfaced road. 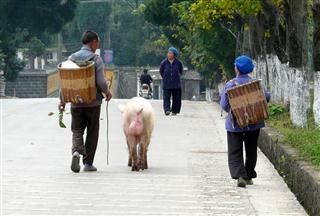 Trying to get through the village of Houchang, Guizhou was well nigh impossible. It was market day and from near and far everyone was heading there, huge groups walking down the roads and across the fields with their baskets. The whole road was blocked by the mass of shoppers and sellers and the buses and lorries were trying to blast a way through them with their screaming horns. The ethnic dress here is predominantly blue so the whole street was a sea of blue tunics and navy, tartan like head scarves. Later, a man on a motorbike came up beside us and asked us to stop to talk. Having seen us riding through the village he wanted to try out his English. He was teaching English at a local school. 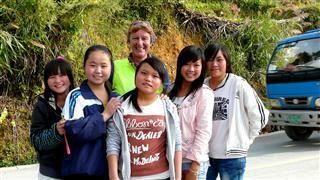 We talked about our journey and told him we were on our way to Wangmo, Guizhou. He warned us the road was 'dangerous' but we assumed he meant the drivers. Just before the start of the first climb we saw a traffic accident. A bus had come down the hill and smashed into a tree at the side of the road. As we climbed up and up there were a lot of landslips, with large parts of the road fallen hundreds of feet into the valley below. A second accident involving a lorry and a car made us think about the advice of the English teacher. 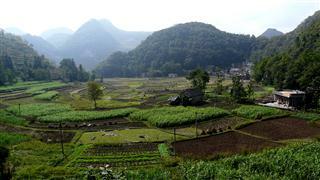 The views over the Guizhou mountains were wonderful and although it seemed remote there were always plenty of people around, walking along the roads, tending their land, herding their cattle and ponies. For lunch we had noodles (yes, again) in a roadside place. A huge group of locals gathered and discussed our map and journey. We wish we had produced a leaflet in Chinese to explain what we are doing. Puncture number five was mended with an audience of Mum, Dad and two children who were walking down the road and just stood around and watched silently. The last long ascent was to 1,630m and having found no roadside food all day, we stopped at the top to eat our last remaining fruit and nuts. A group of young teenage girls walked past and also tried out their English on us. They were so excited to meet us and took lots of photos on their mobile phones as well as trying on our sun glasses. At nearly 4pm we set off on the downhill. The road here runs down a narrow, steep sided valley. A flash flood during the summer had ripped down tons of debris, boulders and earth from the mountains and scoured away all of the road and its bridges. Instead of a smooth surfaced descent there was just a steep, rough, cleared track through the piles of boulders. It was quite impossible to imagine what this force of nature must have looked and sounded like. We needed all of our mountain biking skills for the treacherous 12km descent around boulders, through mud and avoiding other traffic until we reached a broader part of the valley where the road had escaped damage. There were lorries and motorbikes all climbing up the rubble and one man in a sparkling Audi saloon. Even further down the valley there were sections of road which had disappeared and steep rough sections of track to negotiate. It was getting dark, we were at the end of our energy and to cap it all it started to rain. A mediocre hotel didn't help our mood but later we found a restaurant which had different types of meat and vegetables on display. We pointed to chicken, cucumber, beans and aubergine which the guy cooked into four delicious dishes. Strange how we ordered half a chicken but when it was served there were only legs, wings and feet. What happened to the breast? Today would be another hard climbing day with 1,800m of ascent and it was drizzling at 8.00am. Sick of noodles for breakfast we went into the local version of MacDonald's and had chicken burger, fries and orange squash, lots more calories. By 10am the skies cleared and the sun came out. Layers of clothes were soon discarded and for the first time in two weeks it was sun hats, shorts and t-shirts. The first climb was a long one but at the top the road skirted around the top of the valley giving views over the forested mountains and the satisfying sight of the village we had ridden through far below. Drenched in sweat and shaking with exhaustion we stopped at the col for a drink and food. No sooner had we parked the bikes than a car drew up and a Chinese couple got out and insisted on taking photographs of us. We weren't looking that pretty. On the other side we dropped down about 600m to a pretty valley with a reservoir. A roadside restaurant there had a tank full of fish and we choose a couple to be cooked up in broth for our lunch. From here the road followed the river valley upstream with a few climbs. A couple of three wheeled vans passed us both carrying a huge stack of mattresses. Every time we stopped to rest other vehicles would pull up and we were offered lots of cigarettes. We reached Ceheng, Guizhou by 4pm and were relieved to see a newish looking hotel called 'Lui's Express Inn' at the top of the main street. No need to ride right round town searching. This town had a really nice feeling about it. It was Friday so no school tomorrow and families and children were enjoying the warm evening. A crowd of older citizens were sitting watching something on a huge roadside TV screen. There were clear roads, proper pavements and more private cars. After more than 5,200m of climbing in the last three days we were ready for a day off. We spent most of the day hiding in the hotel room, working on the blog and sending e-mail. 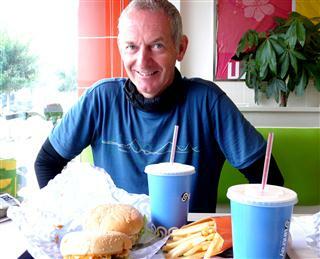 For lunch we went next door to the burger place. Sitting near the window eating our food we had crowds of local teenagers staring at us in disbelief. In the evening we ventured out looking for some good food. The previous evening we had passed a place with an English name board called 'Backstreet Bar'. Inside there was a small bar area and a selection of private rooms. It was owned by a Chinese man named Tony who spoke quite good English. We had a beer and asked him if there was anywhere good to eat nearby. He suggested that if we told him what we wanted, he would order it for us and we could eat it in the bar. We ordered a couple of Guizhou dishes and a big bowl of soup. For some reason we both slept badly. Karen had a nightmare which woke her and Steve was in pain from a cold sore. It was 8.00am before we got up. Breakfast was doughnuts in soya milk at a street cafe. Even there we were not immune from the teenagers with their mobile phone cameras. 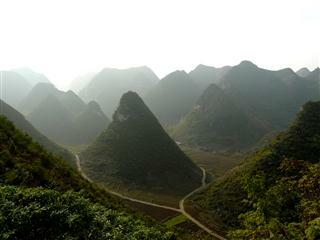 For most of the morning we were slowly climbing up into the Guizhou mountains. Initially the slopes were wooded but as we got higher the terrain was more barren with bare stone and grasses. 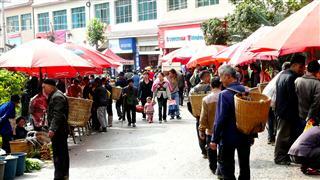 We rode through Ceyang, Guizhou and it was Sunday market. Among the goods for sale were rows of young pigs being sold for fattening. They were lined up on the pavement, all wrapped in wicker baskets, with no room to move. They were very distressed and squealing. Further along the road was this, more pampered pig, strolling along the road. Once up at 1,300m the road went through flat open valleys between the steep sided conical Guizhou mountains and lots of small villages. 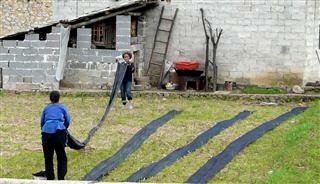 We saw women spreading out lengths of indigo dyed cloth to dry in the sun. The women's head ware changed from tartan scarves to strips of white cloth wound round the head many times to form a 'polo mint' type of hat. The morning's slow climb was arduous and our average speed was only 9kph. Our lunch stop was well planned as just as we sat down with our bowl of noodles it started to pour with rain. By the time we left it had stopped. After lunch the riding was easier and faster with more level parts and some downhill. We arrived in Anlong by 3.30pm so had time for a nap before tea. 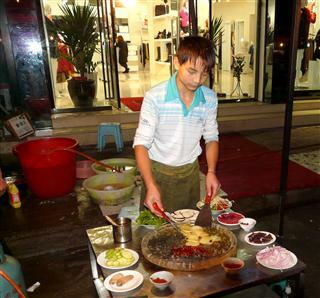 There was a busy night market just down the road from the hotel with lots of food stalls. One had tables with glass hotplates, heated on a gas ring. There was a selection of plates of different meat, fish and vegetables. We chose about 10 different ones and they were cooked for us on the hotplate with the addition of plenty of chilies and soy sauce. It was delicious. Once the morning mist had cleared it was another warm, sunny day. Today's Guizhou ride promised to be much easier than the last four days, with mostly flat and downhill and no big climbs. The downside that we were back on a main road, the G324, which was busy and noisy with fast moving cars and motorbikes overtaking the slower moving heavy trucks. 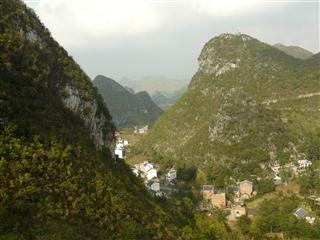 Anlong, Guizhou was a larger place than we had realised with a large area of new development on its western side. The road was being widened and large amounts of topsoil had been removed, leaving a large section of bedrock. On the top of it were two little guys with pneumatic drills, chipping it slowly away. Looked like it would be about three years to move it. Along the busy road, with all the trucks belching out their thick black exhaust, were racks of glass noodles drying in the sun. Further along a group of men were slaughtering and plucking ducks. It looked quite barbaric. During the course of the day we saw "four weddings and a funeral". At 11.30 the school children go home for lunch. They often have to walk a long way and even the five and six year olds are completely unsupervised, wandering home along the busy roads. A group of teenage boys on bikes raced us for a while. We had lunch at Zhengtun, Guizhou - tasty pork dumplings in broth. In the afternoon the traffic seemed to be more manic than ever, with lorries being overtaken by cars which were being overtaken by motorbikes. Several times lorries had to pull over close to us to escape overtaking traffic. Another couple of touring cyclists came towards us on the opposite side of the road but because of the traffic we were all more intent on staying safe than stopping to talk. 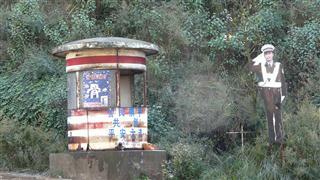 At Dingxiao, Guizhou there was a minor road marked on the map going through Maling Gorge. We thought we might escape the traffic going that way. The road was no quieter and certainly not as minor one. It snaked down into the gorge, passing lots of stalls selling barbecued sweet corn. 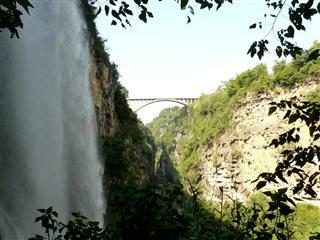 The gorge was impressive and so we decided to cough up the entrance fee and go and have a look. It was 80 Y each to go in and another 30 Y each to ride on the glass elevator into and out of the gorge(who wants to walk up a couple of hundred steps when you've cycled all that way?) There were only a few other tourists so it was peaceful and we spent an hour walking on the pathway along the bottom of the narrow, 200m gorge. There were several waterfalls cascading down the sides, one of which you could walk behind. 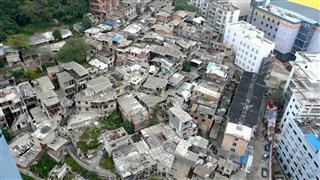 Xingyi, Guizhou is yet another rapidly expanding city. We rode in along a wide, tree lined boulevard with lots of big newly constructed hotels. Deciding that there maybe some cheaper options in the older town centre we rode up the hill and got into the one-way traffic system. The sat nav ran out of power at this critical moment so we rode round in circles at least twice before managing to find a hotel. The city centre was impressive at night with lots of special lighting and busy with people shopping, sitting and, of course, dancing. At 7am it was pouring with rain so we lay in bed doing the crossword and trying to decided whether to stay another day in Xingyi, Guizhou. By 7.50 it had stopped so we packed, found doughnuts for breakfast and headed off, this time avoiding the one-way system and navigating through the quieter back streets. The G324 climbs up a hill out of the city on a concrete road. The concrete surface has been cut into strips and roughened, presumably to slow the downhill traffic, but it made for a very uncomfortable ride up.We expected the road to be just as busy as yesterday but there was much less traffic, and most of the heavy trucks turned off after about 5km so from there the road was quiet. After about 10km there was more road construction. Our road ran along the side of a slightly elevated section of the new one on an unsurfaced track. The overnight rain had turned it into a mud bath with thick orange goo and big puddles. Although it was only about 1km long we were completely be-splattered. The sky was grey and it was much colder, Steve had to stop to put on his tights. He needed them because after that was a long snaking descent into a river valley. The new, surfaced, but not yet open, new road was high up on the left side and the railway on the right of the valley. After the long downhill there was another short section of rough road and then we came onto a dual carriageway. A sign at the side prohibited bicycles and pedestrians but there was no alternative road so we carried on. 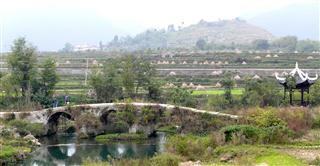 At this point we crossed over the border of Guizhou and into Yunnan. Initially we had the whole carriageway to ourselves. It was quieter than any of the country lanes we have been on. We gradually saw more traffic, bikes, pedestrians and the odd buffalo and decided that there was nothing to worry about. The three Guizhou policemen at the toll gate just laughed at us. The road went through several small villages and we saw a popular little restaurant so stopped for lunch. The place was crowded with men all eating, playing cards and drinking games. The owner showed us a huge cold joint of roast beef. He sliced off a generous amount and served it in a pot of broth with plenty of raw green vegetables to add. It was the most wonderful bit of meat we've had since leaving home. After lunch there was a long slow ascent and then an easy slow downhill to Luoping so we finished the ride before 4pm. We stayed at the brand new Luoping Hotel. The bed linen and towels were brand new and the beds were very, very comfy. We had to get maximum benefit from the comfy beds so had a lie-in till 9.00am this morning. It was a slightly boring ride, continuing along the dual-carriageway. It by-passes all the villages and there was little to see. There was a gradual climb up to 1,965m and it was colder still. There were few trees and less agriculture. The low grey skies did nothing to lift our spirits and it was cold. Shizong was another featureless town. It did have lots of wide roads and open areas with modern sculptures but no people. They were all in the narrow rough streets in the town centre. The hotel we booked into did not have any air-con or heating and we were frozen. Thinking we could warm up over a meal we went in search of a restaurant. But all the restaurants have their doors wide open and no heating. 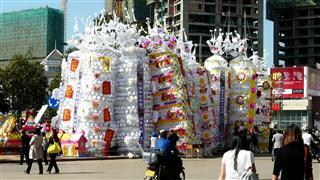 These Chinese are made of stern stuff. No wonder they like their pots of broth on a burner in the middle of the table. It's the only way to keep the food and themselves warm. Opposite the hotel was a cafe which served breakfast. It was very popular and we sat on a table next to the Guizhou police, eating noodles and drinking hot milk (cows, for the first time). The grey skies of yesterday were gone and replaced with cloudless blue. We left town on the old G324 road to avoid riding through a tunnel. It climbed a small hill through pine forests which were alive with bird-song. It rejoined the dual carriageway and we rode through farmland with bright red soil, contrasting with the grey rock mountains behind. The maize had been harvested and the corn stalks were collected into sheaves standing in neat rows along the edges of the fields. The road climbed gradually to 2,100m, through isolated villages where the main form of transport was ox-carts, most of them travelling in the wrong direction along the hard shoulder. At Zhaokua the highway ended and became the G78 and bikes were definitely not allowed. Turning off onto the old G324 we were back onto a rough and poorly maintained road. It was busy with heavy lorries transporting coal and quarry materials. In places it was just as rough and difficult to negotiate as the G321in Guanzhou had been. At least it was warm and sunny and mostly downhill. Luliang is close to an Air Force Base and low flying jets flew over our heads as we approached. 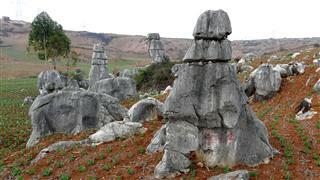 The road into the town was lined with stone masons carving grave stones out of pale grey rock. We rode a couple of circuits round the town looking for a hotel near the centre but could only find old, grubby ones. There was something going on in the town square, masses of flowers and these large paper and flower creations. We ended up riding back out to the edge of town to book into the big Tong Le Hotel, apparently the best in the area. We were befriended by one of the young trainee hotel managers who spoke very good English. He had just completed his degree in Hotel Management and Tourism. He invited us to join him at the hotel staff's evening meal which was only 10Y each. It was another blue sky, sunny day but very cold, even at 9.30am. Breakfast was included in our room price but any hopes of bacon or toast was dashed and it was noodles or nothing. There was some water melon and hard boiled eggs. We arrived at the outskirts of Shilin at 12.30 and had lunch in one of the numerous roadside restaurants. We wanted to sit at one of the outside tables in the sunshine. The staff were nervous about serving us and seemed to be drawing straws for who got the task. Eventually a waitress brought us a menu with an English section and we ordered what everyone else was eating, the roast duck. They brought us a whole one, complete with head, whose accusatory gaze was a bit off putting. Crowds of tourists were milling around the other restaurants and when we arrived at the Stone Forest Scenic Area it was wall to wall tourist buses with groups of big Chinese tourists in their matching caps following guides with flags on sticks. Everything we hate about sight seeing. We were also nervous that such an obvious tourist venue would be a magnet for petty thieves, making leaving the bikes and gear a big risk. At the entrance gate the advertised price for entry was 175Y each, for two of us nearly our whole day's budget. We turned round and left. 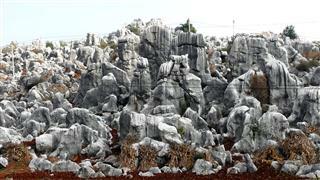 Actually, as we rode back along the road into town we saw enough sculpted and shaped rock to satisfy our needs and all for free. We also had to mend two more punctures. We booked into a little hotel in the town. It was a simple affair, it did have a sit-on toilet but no heating or air-con. The owner was friendly and obliging and let us lock the bikes up in his shed. Walking up the main street to find somewhere to eat, we came across a couple of men butchering a pony on the pavement, washing away the blood and gore with a hose pipe into the drain. Not very appetite inducing. We chose our meat carefully at the restaurant not far away. Returning to our little room afterwards we kept most of our clothes on to get into bed, it was so cold. The morning was cold and cloudy as we set off. Still following the G324 we left Shilin and the road was almost deserted. There were yet more strange rock formations littering the fields. Immediately there was a climb but it was slow and easy. After that was a really long descent. The road was wet from the lorries that use water to cool their brakes and the road surface was covered in oily residue which splashed all over our shoes, bags and bikes. This took us into a river valley and we began to climb gradually upstream through an ever narrowing gorge. There were two railway lines, one on each side and they were way above our heads so we knew there was quite a bit more climbing yet. The sun broke through the clouds and meant some layers of clothes had to be shed. At the top of the gorge we came out onto plateau with barren mountains towering above it. We ate lunch in the next town before continuing to climb ever upwards. The scenery here reminded us so much of Spain with the scent of eucalyptus, prickly pears, white washed villages and herds of goats. With relief we reached the highest point after 70km at 2,187m. The guard on duty looked a bit tired and didn't pay us much attention. After that we expected a nice long downhill but there were still a few short hills to go. By now the traffic had increased and was quite heavy and chaotic with the cars and lorries forming two lanes wherever possible and weaving in and out. 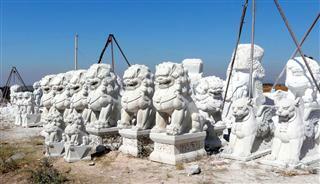 On the outskirts of Kunming, predictably, they were constructing a new road at a key traffic hub. All of the traffic ground to a halt as we came onto an unsurfaced and very rough uphill with two roads feeding heavy lorries and a very confusing diagram above our heads of the route into the city. We were on the equivalent of a huge roundabout jammed with lorries all vying for the best route through the potholes and boulders which made up the 'road'. At the top of the hill we had to turn left through the mass of lorries going right and then cross the flow of traffic coming in from the left. The next section of road was no better, with the added interest of increasing numbers of pedestrians and motorbikes to avoid also. There was a car-wash along here so the bikes got most of the mud washed off them but not so much of the oil. Once past the road works the route into Kunming was relatively easy with a separate bicycle lane. Of course this is China so there were cars parked on it, taxis driving up it and plenty of strolling pedestrians. The first two hotels we tried were too expensive but the 'Spring City Star Hotel' on the other side of the road had new, clean rooms for 190Y and suited us perfectly. For our evening meal we walked to find a restaurant recommended in LP called Dianwei Fanzhuang. We found a nice restaurant, very smart, which had a menu with pictures and some unusual, delicious, carefully prepared and served dishes. Not sure if it was the one in LP or not. 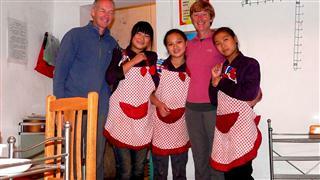 We will be spending five days in Kunming, resting, sightseeing and getting our Vietnam visas.